Well it’s the 19th of the month and I’ve bloody well done it. I’ve got the first 100 mile month that i’ve ever managed. Last night I went into Manchester drinking, so I left my car in Didsbury in a cunning ploy to get enough miles in to take me over the 100 mile mark. I chose a fairly straight forward route. Road into Castleton and then join the canal towpath and cycle along it all the way to Manchester. The first part of the plan worked, in that I cycled to Castleton. Could I find a way onto the canal towpath? could I buggery. So I eventually ended up cycling past All in One garden centre to Stakehill Industrial estate to join the canal towpath there. The towpath was in fairly good (singletrack) condition with deep ruts and drops down the side of each of the lock gates; most of them were smooth gravel, but there were some that were cobbled and rutted. Today no obstacle was unbeatable as I enjoyed a great ride towards Ancoats. There were a few areas where I was concerned that I was going to pick up a puncture, but fortunately I avoided any. All flights of steps were ridden, apart from one that was strewn with glass. This warranted a short carry and then I continued. After about an hours riding I got to the back of Picadilly Station, the wharfes around Ancoats are good fun to ride along, and then I headed off down Oxford Road, through Rusholme and Fallowfield before arriving at work. Looking at the GPS app it said 22.43 miles, but when I opened it up again it claimed the program had crashed and it had registed 21.53 miles, some 0.33 miles short of the 100 mile target. I thought about whether I could say this and be done with it, but I decided that when I got home I’d have a quick blast up the cul-de-sac and back to get me over the 100 miles. So what have I gained from this? An incredible desire to ride as often as I can, regardless of time available. Just ‘fitting in’ another 45 minutes or hours ride. I need an excuse to stay in and watch television now in an evening. Lets see what the rest of the month brings and the rest of the month. Sorry, but no photos were taken as I was on a bit of a mission to get there in less than 2hrs. Total time for the 21.53 miles was 1hr 50 mins. I couldn’t let Phill have more miles than me at this point in the challenge, although I think we’ve both surpassed where we though we would be halfway through the month. I decided to get back off road for more of the ride tonight so I rode a nice loop with probably 60% asphalt and 40% off-road, singletrack. I found a new piece of bridleway, which name I can’t remember at this point, but it was nice and slippery, narrow with nettles either side. 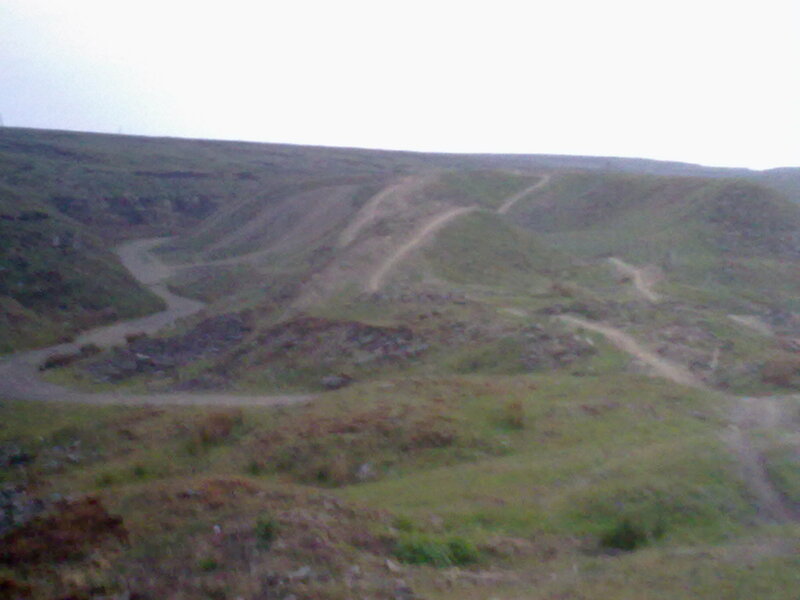 A real concentration part, followed by dusty rutted farm track that certainly gave my arms a good workout. The plan for the weekend is to ride to work and collect my car. The route is approx 20 miles so I’m hoping to have the 100 miles sewn up by sunday. The rest of the month will be prep for Manchester Blackpool and to see how many more miles I can fit in. I’ve already added the screen shot to the June 100 page, but this is a quick update on tonight’s miles. 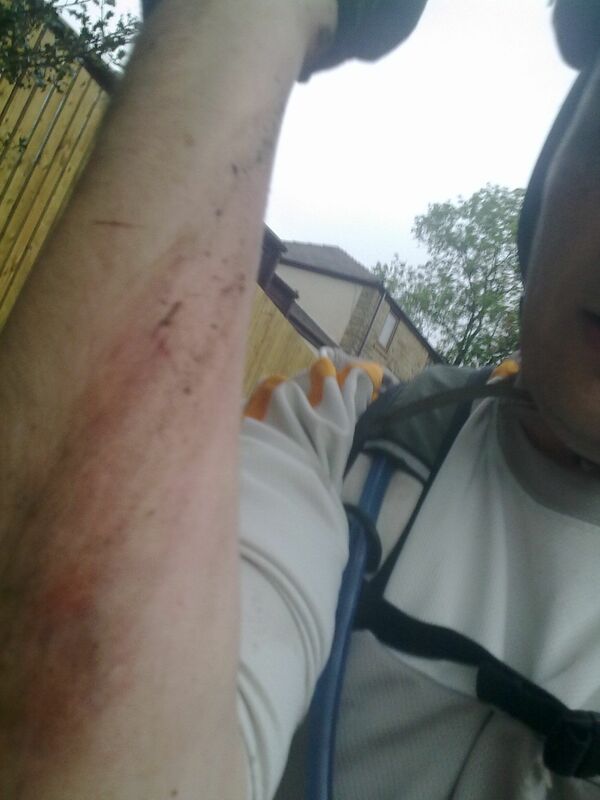 I’d got a window of 75 minutes for a ride so I decided to repeat the ride I did that resulted in the fall. I approached the steps a bit more cautiously than before, even though it was dry. A quick squirt down Redfearn Wood to then ride over to Shawfield lane. I seem to be using much less gears than I used to and can rider longer and faster on the climbs whilst using taller gears, do it shows that fitness strength and endurance are all improving. I carried on over Elmsfield and dropped down Furbarn lane and Jowkin lane joining Norden road at Bamford Chapel. Down to the lights and along Bury Rd before turning off towards the Crimble and descending down a very slippy crimble lane (marble like stones) over towards bury old road. I had planned to have a couple of laps round Springfield park but I thought there wasn’t enough time. 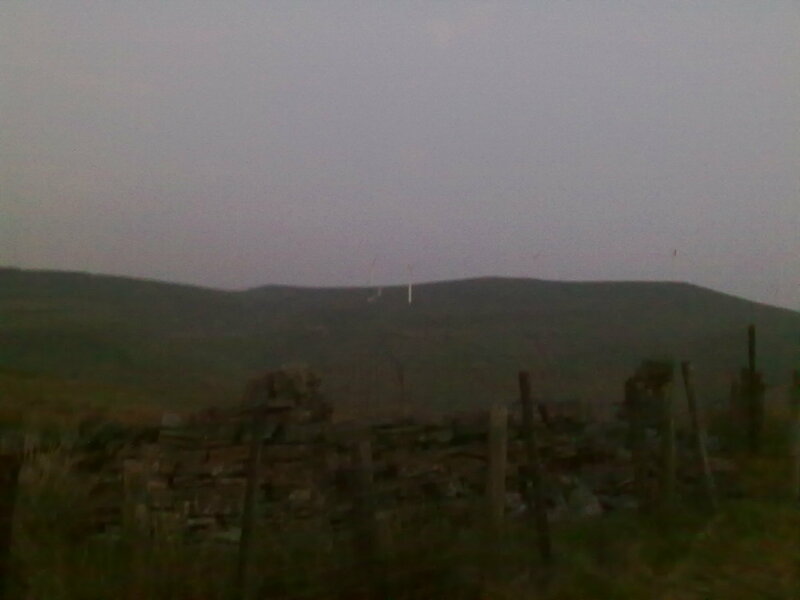 Past the sewage works, which were very smelly tonight, to Sandy lane and a climb up Edenfield Rd an Caldershaw Rd. I noticed after I’d got past the Black dog pub that I’d still got 20 mins left so I did a number of loops around stonehill and elm park to max out the mileage. Another ride this morning. Not much to report other than due to a late night last night and a still sore shoulder I only managed 6.74 miles. Averaged 8.8 mph and took 45mins. I got the opportunity to get out on the bike tonight so I jumped at the chance. I’d already worked out roughly where I was going to go. So I set off, dropped through Stonehill to do practice my skillz on 3 steps, 3 steps! I’d ridden them easily at the weekend so tonight I hit them a bit harder and faster. What I had forgotten was that it had been raining and that the leaves on the corner would be greasy.. Cue my first fall in ages..
Front wheel just slipped away from me and before I could react i’d slammed down onto the tarmac. I untangled myself from the frame and after a quick sit rep to check everything worked on the bike I continued. A slower than planned ride over Shawfield Lane and up past Whittaker Moss, down Furbarn Lane and Jowkin Lane. Rather than returning along Bury Road I turned past the Crimble and on to Bury Old Road to Sudden and back along Edenfield Road and Caldershaw Rd. I considered doing a lap or two of where I live to get over 50 miles but by then my neck and shoulder were aching like mad, so I decided to call it a night. This morning I took my daughter for a rather wet ride. I’d thought about driving over to Firgrove, near to where Phill lives to enjoy a ride along the canal to Hollingworth Lake and back. But I couldn’t be bothered taking my bike apart to put it in the car. 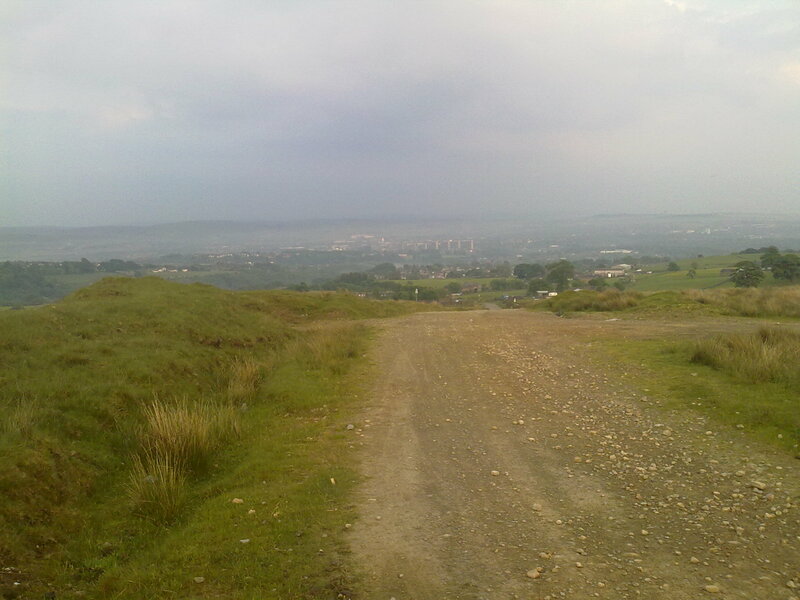 So we cycled down Rooley Moor, up Woodland Drive. 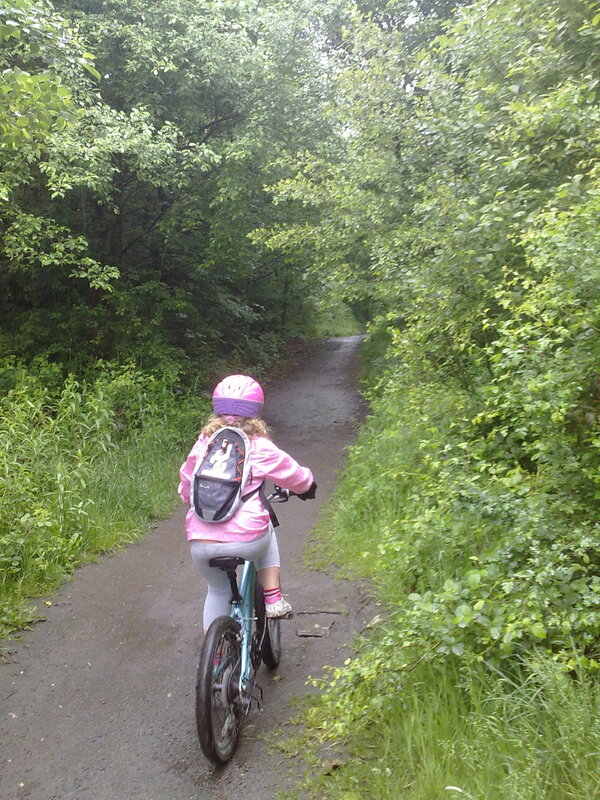 Correction – I cycled up Woodland drive whilst my daughter pushed her bike up it. At least that gave me an opportunity to add extra distance to the ride. Eventually we got onto the old railway track, she was a little nervous about riding over the viaduct as she’d heard of the terrible accident that had happened there last week. We continued up to the old bridge near the sheltered housing before turning round and cycling back and up prickshaw lane. The rain was getting heavier, but we didn’t mind and eventually got home 90 mins after setting off and covered 5.77 miles. Less than two hours after getting back from the earlier ride and consuming 2 slices of cheese on toast and a jacket potato with beans, I was out again. I only had a short window of opportunity and in hindsight should have waited until tonight to go for a longer ride. A quick blast across shawfield lane into norden and and ip behind the old peoples home I suddenly realised I’d not hit start on the sportstracker. Quickly rectified I carried on, climbing up past Whitakker Moss and dropping down furbarn lane, Rake and jowkin lane before looping back along bury road and up along edenfield and caldershaw roads. Avg speed over the last 5 and a bit miles of the 7.25 was 10.2 mph. This would have been higher if the first downhill 2 miles of the ride had registered. 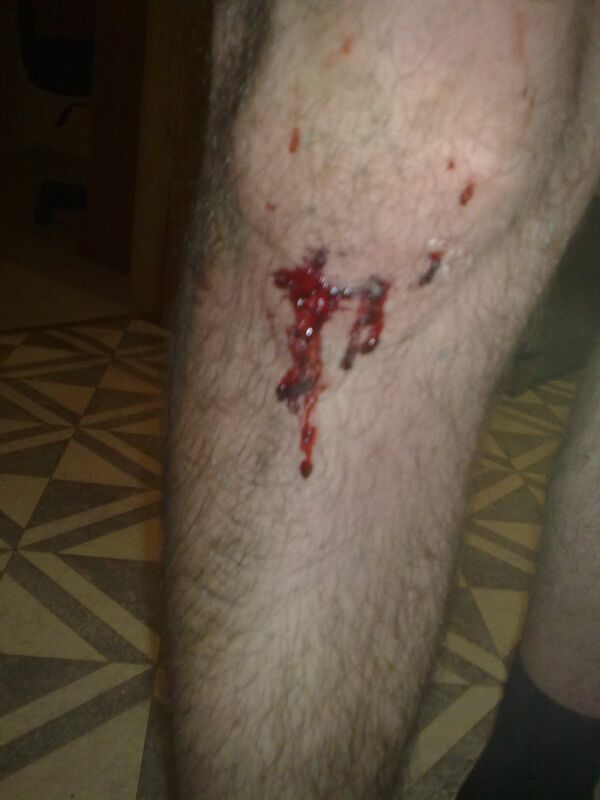 I briefly flirted with the idea of a 3rd ride tonight but there was nothing left in my knees. This last week I have all but matched last years mileage for June. I suspect this could be a good month. Last night was my second #June100 ride and I was going to make up as much mileage as I could. 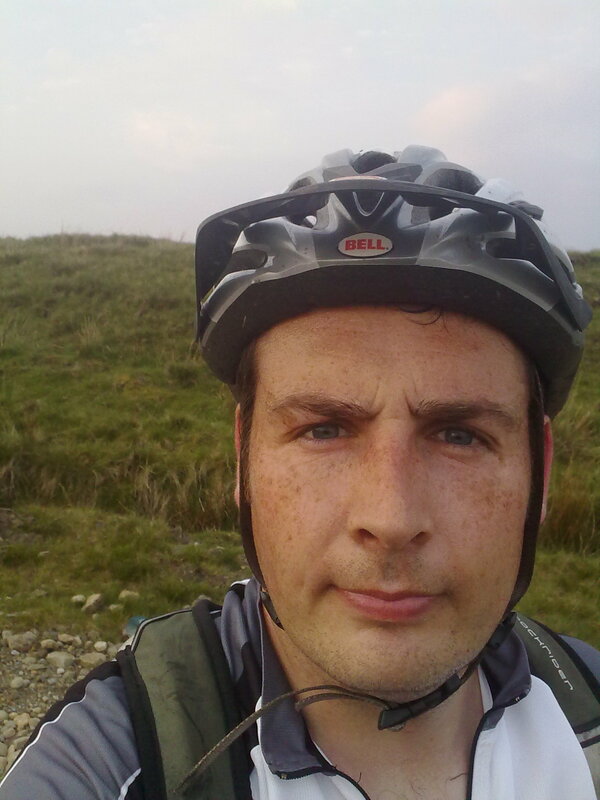 There was no avoiding it – I had to ride up Rooley Moor; it was hot sticky and the air was very still. I swapped the tyres over to my trusty 2.0″ Michelin Country Trails as a prior downpour looked like it could have been a muddy ride but fortunaltely the dry period we’ve had meant that the rain just soaked away and the tracks were still relatively dry. As ever the climb was relentless and I used ‘stopping to take photos’ as an excuse to have a rest. View back towards Rochdale and the 7 Sisters clearly in shot. I kept slogging away and it was a slow slow climb last night eventually getting to top o’leach about 30 minutes after i’d set off. Very hot, sweaty and not photogenic! Cycling up past the ruins of the old Moorcock Inn I saw a fairly large owl flying near the track. Unfortunately I didn’t manage to get a photograph of it. Nor, did I take a photo of the lower section of a lamb’s leg. Poor thing must have been got by foxes. 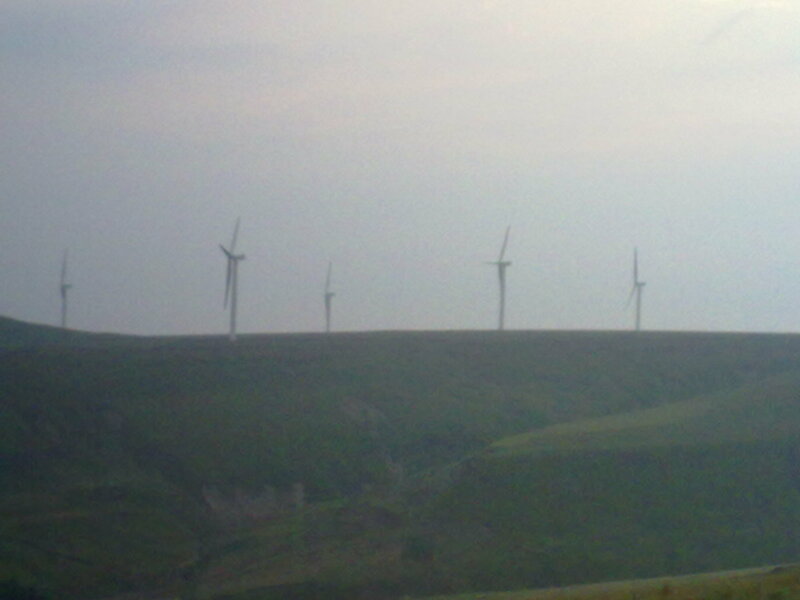 As mentioned previously, the air was still and all of the wind turbines sat still. It was a strange feeling looking at the magnificent structures. All I can say about this place is, it’s FANTASTIC! I only had time for a couple of loops around it, but it tested me. This can only be a good thing! I managed to do the descents that I aimed to do but failed on 1 which was very gravelly and due to a not clipping in in time/picking a good line resulted in a comedy ‘stuck’ moment where I couldn’t get off the bike as my foot was slipping and the bike was slipping. I had to reach behind me and release the seat post drop it and hop off the back of the bike. Oh well maybe next time i’ll get it right. The key to that place is definitely momentum and choosing theright gears to attack the sections. The worn cart tracks made for interesting riding as the back of the bike kept slipping away and I had to constantly correct the bike. 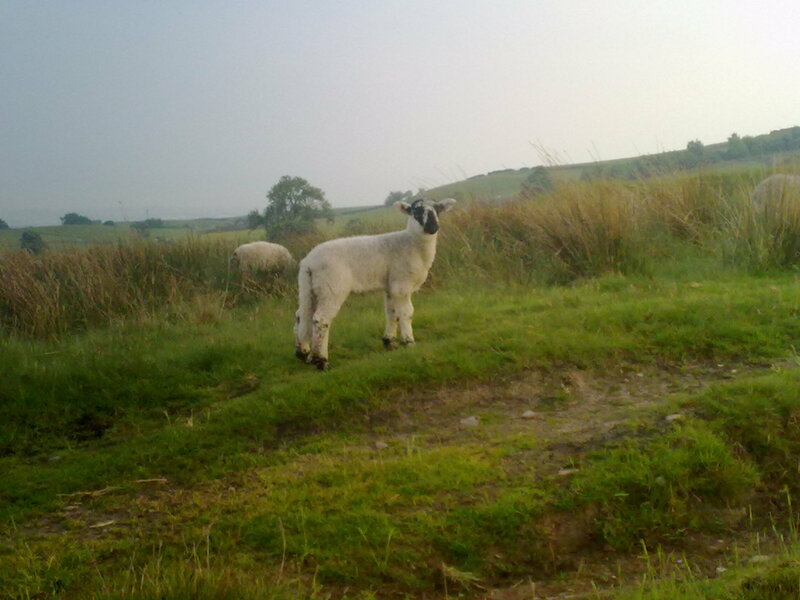 A bone shaking ride down Gin Croft Lane and then a cautious ride back along ‘Owd Betts’ Edenfield Road. No idea what average speed was as the sports tracker software cocked up again mid ride.